Body Gospel: The Answer to Your Weight Loss Prayers? An instructor that owns too many fitness DVDs!?!?! Guilty as charged. I get a lot of good class ideas from them. Plus, it's nice to take someone ELSE'S class for once! Body Gospel is a recent DVD release featuring Donna Richardson Joyner, an inspirational, who, according to Wikipedia is not a minister, but she DID appear in Platinum Series: Buns of Steel and holds a place in the World Book of Records for leading the world's largest line dance! I have to admit, the concept is intriguing, but will it be as successful at its sister BeachBody DVD series P90X? (another workout sensation that deserves it's own post ). The tagline for Body Gospel is "If you believe, You will succeed." Religion aside, I like that saying. NBT or fad--what do you think? I want this shirt! Lifting weights is one of the best things a girl can do for her body (and bones!). I currently teach a "Chizel" weights class at the YWCA, but I try to incorporate weights into all the classes I teach--it does a body good. Let's not kid ourselves--cardio is absolutely necessary to stay fit and consistently burn fat. But cardio can only do so much. I see women who are outstanding runners, kickboxers, and steppers, but without some kind of strength training they may never achieve those tight Beyonce-esque curves. The myths about women's weight training and female bodybuilding do not ever seem to go away. With this article, I'd like to share the facts regarding weight training and female bodybuilding. Women's Weight Training Myth #1 -Weight training makes you bulky and masculine. Due to the fact that women do not, and cannot, naturally produce as much testosterone (one of the main hormones responsible for increasing muscle size) as males do, it is impossible for a woman to gain huge amounts of muscle mass by merely touching some weights. Unfortunately, the image that may come to your mind is that of professional female bodybuilders. Most of these women, unfortunately, use anabolic steroids (synthetic testosterone) along with other drugs in order to achieve that high degree of muscularity. In addition, most also have good genetics coupled with an unbelievable work ethic that enable them to gain muscle quickly when they spend hours in the gym lifting very heavy weights. Believe me when I say that they do not look like that by accident. Women who conduct weight training without the use of steroids get the firm and fit cellulite-free looking body that you see in most fitness/figure shows these days. Women's Weight Training Myth #2 - Exercise increases your chest size. 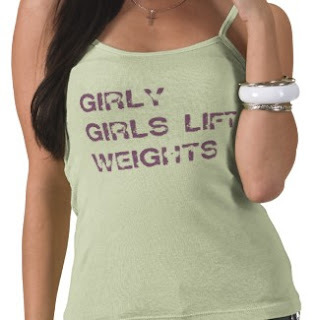 Women's Weight Training Myth #3 - Weight training makes you stiff and musclebound. Women's Weight Training Myth #4 - If you stop weight training your muscles turn into fat. Women's Weight Training Myth #5 - Weight training turns fat into muscle. More alchemy. This is the equivalent of saying that you can turn any metal into gold; don't we wish! The way a body transformation occurs is by gaining muscle through weight training1 and losing fat through aerobics and diet simultaneously. Again, muscle and fat are very different types of tissue. We cannot turn one into the other. So, don't be afraid of the weights! You'd be surprised at how much inner and outer strength you really posses! One last thing...in this blog you'll hear me talk a lot about my fitness idol, Chalene Johnson. If you're working it out at home, I highly recommend her weight training DVDs, ChaLEAN Extreme! Any of Chalene's DVDs really give results...and this one looks like it kicks a**! I am completely and unhealthily obsessed with the letter B. I think it's also one of the most compelling letters in the English language. B, pronounced "Be," denotes existence. In the same vein as "I think therefore I am," if you can be something then you have to power to exist. "Be" is also a verb. Be present. Be yourself. Be happy. "Be" in one word captures a recommendation, a command, and an action. Rhetorically, by telling someone or something to "Be" you give them the power to choose to partake in that suggestion, action or realm. Deep thoughts, right? I'm so happy that you stopped by and I hope you continue to follow my blogging escapades! You go, girl. Be yourself. Be bold. Be active. Be foxy.